A familiar moniker stood out among the new center console brands at the Palm Beach International Boat Show: Blackfin. Is this the same builder that carved out a niche in fishing boat lore as one of the best-riding offshore boats? Yes it is. Fans of Blackfin may have been unaware that the boats never really went away. And now the brand is being “reintroduced” with the promise of an entire fleet using the original designs. At the March 21-24 show, brokerage firm Dwight Tracy & Friends and boatbuilder Blackfin Boats Inc. launched a partnership for the marketing, sales and exclusive worldwide distribution of a new, expanded line of modernized Blackfin sportfishing boats. Blackfin Boats, which currently consists of Miami boatbuilders Jose Suarez and Gustavo Cardona and various contractors, has been quietly turning out about a dozen boats a year since 2001. Cardona and Suarez have built roughly 100 Blackfins — a 27-foot center console, a 34 Open and a 34 Fisharound. The 34s are lengthened outboard-powered versions of the Blackfin 32 (originally designed by Charles Jannace as the Blackfin 31 in the mid-’70s). 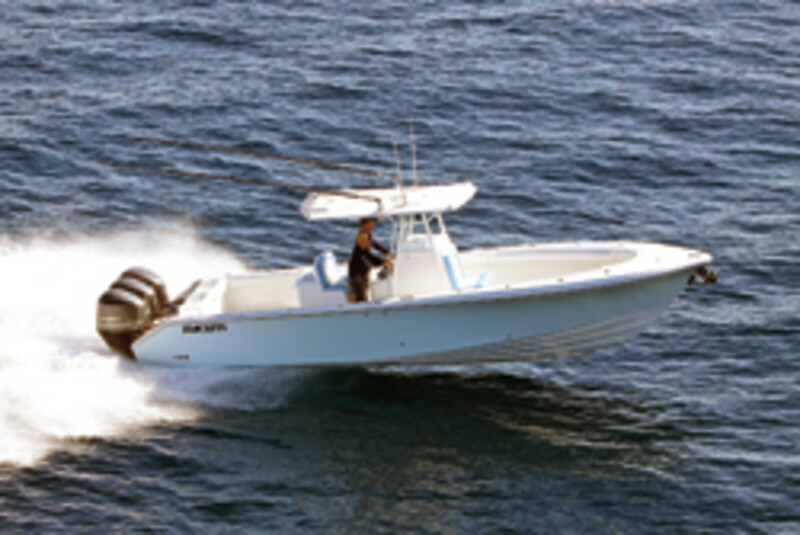 The company displayed a center console version of the 34 with triple Yamaha F300s at the Palm Beach show. “It’s a great product, and it is time to get it out there with the competition,” says Suarez, 42, who builds the boats with Cardona, 43, in their 16,000-square-foot facility in Opa Locka, Fla. “We have been relying on word of mouth and our customers. The boats have been built to order for the last 11 years and shown only at local boat shows. 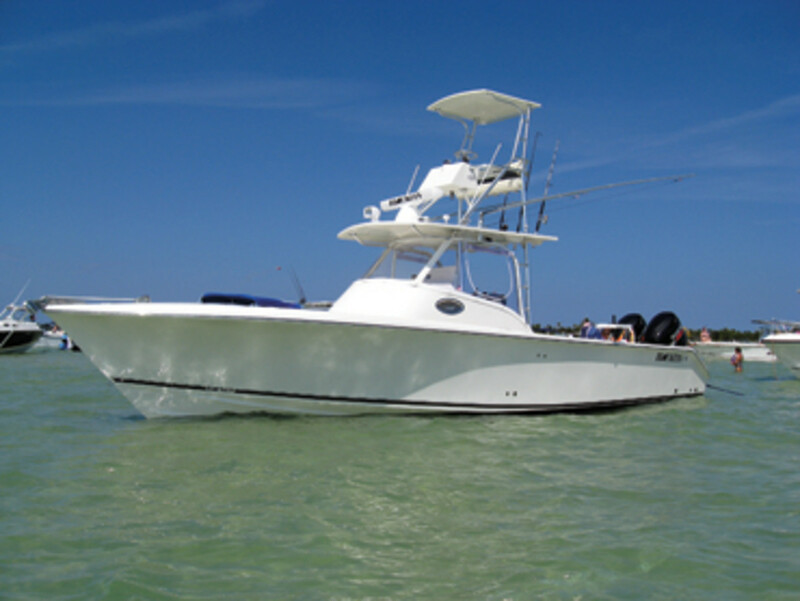 Blackfin, which was owned by Carl Herndon, who later founded Jupiter Boats, fell on hard times in the late ’90s. Detroit Diesel bought out the company and sold the assets to investor Alvin Wright, who initially tried to subcontract the construction of the boats. His own company later built them with the supervision of Cardona, a Cuba-born American boatbuilder. In the early 2000s, Wright turned over the tooling and the rights to the brand to Cardona. He eventually partnered with Suarez, and for the past decade they have been building about a dozen Blackfins a year, selling them mainly in South Florida. Blackfin Boats has the molds for the 25 and 27 center consoles, the 33 Combi and the 38, 40 and 42 Express, Suarez says. The short-term plan is to first build a modern version of the 42 Express, Friedman says. That boat is expected to be finished in just under two years, he says. In addition, DT&F’s marketing arsenal will include fishing events that showcase the boats in action. “We have lofty goals but reasonable goals,” Tracy says. Suarez and Cardona work out of a 16,000-square-foot building (with about another 6,000 square feet available under temporary shelter) in a fully secured courtyard, Friedman says. Negotiations are under way to expand into the adjacent part of the building, which would add about 18,000 square feet, he says. With the anticipated growth, the pair may have to curb some of their hands-on work, Friedman says. “We have a labor pool in South Florida that is replete with skilled people who have worked at places like Bertram,” says Friedman, who expects the work force to double during the next two years.